Does NBC have a truthiness problem? Like it wasn't bad enough she sneaked out of her house to get restaurant take-out while under quarantine for Ebola exposure. 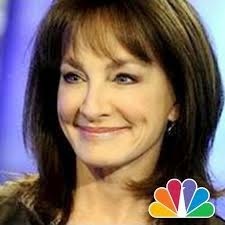 This month NBC's medical "expert" Dr. Nancy Snyderman lost her remaining shred of credibility after misleading viewers on The Today Show about HDL and LDL cholesterol and the Paleo diet. The so-called "Women of Today" -- Savannah Guthrie, Natalie Morales, Hoda Kotb, Tamron Hall, Dylan Dreyer, Sheinelle Jones and Erica Hill -- all had their blood tested for cholesterol levels. And here's why it was wrong on so many levels. "Your HDL was 108. But your LDL, which you want 60 or lower is 112. 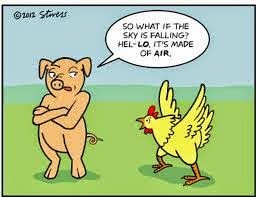 So that might easily be related to animal fat. So if I were you I would get off that paleolithic whatever it is, that caveman diet, and just go back to being a girl." Hello? Looks like you mixed up your Hs and Ls there, Nance, making it sound like Hill's numbers were far worse then actually they were. Some visitors to The Today Show website, which featured a video clip of the segment, were appalled by Snyderman's number confusion. One commenter wrote, "As a woman who works in cardiology, I am very disappointed that she got this so wrong. It is so important to get this message out to women, and today she confused so many. Even if this isn't her personal speciality, it is common knowledge in medicine." But that wasn't the only mistake Snyderman made. After first lauding a few of the newswomen for their lab results, Snyderman told Hill, "Erica, you came in with the all-time worst numbers. You came in at 228 which on the surface sounds like, uh, high. But interestingly, because you're fit and you exercise, your HDL -- your protective number -- is high. So it skews you high a little bit." Ah, but it's not just about exercise. Even Big Pharma loving WebMD admits that increased HDL happens when you eat a diet far lower in carbs than the American Heart Association recommends. Thus, people who follow Paleo diets may be more likely to enjoy better heart health than those who follow the carb-loving USDA dietary guidelines bought and paid for by the wheat, corn and sugar industries. The shamed Hill was left as red-faced as her dress, "confessing" she has been eating more, gasp, red meat and bacon. "I'm on this weird 30 day diet where I've given up grains, dairy, sugar, legumes and alcohol." Please don't apologize for not eating sugar, Erica. You weren't the one giving out lollipops after the blood draws. What's unfortunate is that Snyderman dumbed down the cholesterol story to elementary school level by making it sound like there are universally agreed upon "good" and "bad" numbers and unless you fit into a prescribed range you should be signing up for a lifetime supply of Lipitor. For one thing, HDL and LDL are not even cholesterol per se, they are lipoproteins, which are like boats that carry cholesterol as their cargo. Not the same thing at all. Nor did Snyderman mention the role of triglycerides in assessing the risk of cardiovascular disease (CVD) and the preference among many lipid experts of using the ratio of triglycerides to HDL to tease out whether one's LDL carries large buoyant particles or smaller dense particles. It's the small dense ones that lodge in the arteries, and if your triglyceride levels are low, you likely have more of the large buoyant ones that don't cause problems. In more recent years, scientists discovered two types of LDL cholesterol. One type consists of large, fluffy LDL particles that appear to have no potential to cause atherosclerosis or the development of plaques on the large or medium-sized arteries. The other type consists of small, dense LDL particles that are strongly associated with arterial plaques and this can increase the risk of heart disease. So now you have good “bad” cholesterol (large, fluffy LD particles) and bad “bad” cholesterol (small, dense LDL). Getting confused? Well, so is everyone else who is fighting the cholesterol wars, because we now know that the more bad “bad” cholesterol you have, the more likely you are to have a heart attack, whereas having a high level of the good “bad” cholesterol isn’t likely to have any adverse health effects. How can you tell which type of LDL you have? All you have to do is determine your ratio of triglycerides to HDL cholesterol, which would be found as part of the results of your last cholesterol screening. If your ratio is less than 2, you have predominantly large, fluffy LDL particles that are not going to do you much harm. If your ratio is greater than 4, you have a lot of small, dense LDL particles that can accelerate the development of atherosclerotic plaques – regardless of your total cholesterol levels. Understanding the relationship of cholesterol to CVD risk is incredibly complex and I am still wrapping my brain around it. My favorite source of information right now is an eight-part series that breaks down the science behind cholesterol by Dr. Peter Attia on his blog, The Eating Academy. Unless you are a biochemist, you may have to read it several times before it sinks in. The bottom line is we are still learning about the link between cholesterol, diet and heart health every day. Let's not just be all smug and pretend we know it all when we don't. Though a person's financial sitch has a lot to do with how they react to a price bump on a signifact monthly budget item, their values, priorities and commitment to losing weight also affect how horrified or complacent they feel about paying more to lose weight on the Medifast 5&1 Plan. For the record, I am no longer using Medifast to lose weight since I achieved my ideal weight almost a year ago. However, if I were still consuming the replacement meals to shed pounds, the price difference would have annoyed -- but not deterred -- me from continuing to purchase my beloved soft bakes, ziti marinara, mashed potatoes and other favorite products. The more money you spend on Medifast replacement meals, the less likely you are to go Off Plan. Many people stall their weight loss with too many cheat days, a misguided approach that makes them pay for the meals far longer than they would if they stuck religiously to the diet. Money is tight for many people these days. An extra dollar or two for a box of Medifast meals can mean the difference between being able to afford the meals or having to find a cheaper, albeit less effective, option. Medifast executives earn outrageous salaries and bonuses relative to their actual performance. Instead of raising prices, the company could and should lower their compensation. Though I am sad to see the price of Medifast replacement meals increase, I still think Medifast -- especially when combined with a health coach from Take Shape for Life -- is one of the cheapest and most effective ways to lose weight quickly and safely and learn healthy new habits that can help you maintain your ideal weight long after you stop paying for the food. Though concerned parents work hard to keep their children away from hard drugs and violent video games, a stealth nutrition education website is sneakily undermining their children's health and safety. 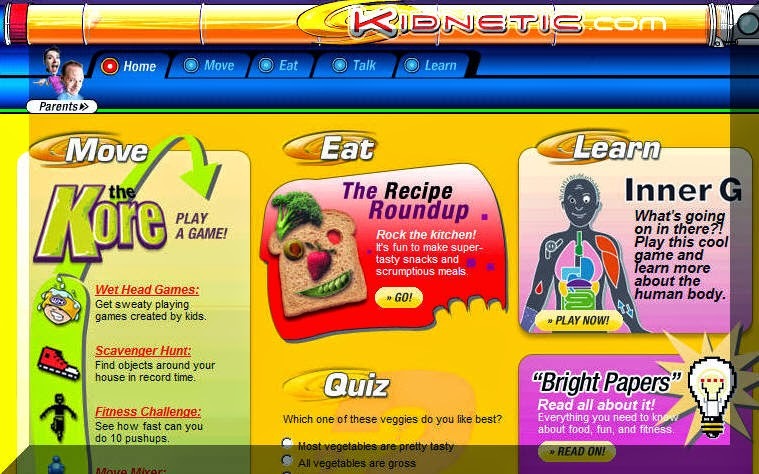 Kidnetic.com, the love child of the food industrial complex and federal government, is a propaganda tool designed to trick parents into killing their children with sugar. colorful game-filled website that purports to teach parents and children about eating healthy. The only problem is that it does just the opposite, like a nutritional Bizarro World. For example, one of the "healthy" recipes under the website's Smart Snacks category is the Groovy Grape Ape Smoothie, a lethal concoction of grape juice, low-fat fruit flavored yogurt and banana that has a whopping 49 grams of sugar per serving. That's more than 12 teaspoons of sugar. What kills me is that the heading for the nutrition facts is "Why It's Good for You." It's like an ad for handguns that says they they're good for children because they reduce class size. The mainstream American Heart Association recommends that children ages 4 to 8 consume no more than 16 grams of added sugar a day. So even if we deduct the 7 grams of sugar from the half banana and another few for the lactose in the dairy and possible actual fruit in the yogurt, we're still left with 18 grams of sugar from the grape juice. 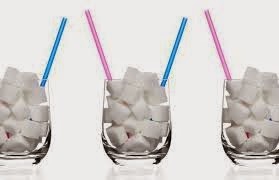 glasses of sugar cubes as most fruit juice. Meanwhile, another kid unfriendly recipe on the website, Dirt Bowl Dessert, contains low-fat chocolate grahams, chocolate pudding made from fat-free milk and Gummi worms. That's another 26 grams of sugar added to the day's load. What is especially nefarious about the unholy alliance between the food industry, federal government and alleged health professionals is that lending their names to the Kidnetics.com website will cause gullible parents to believe they are feeding their children nutritious meals and snacks. Keith-Thomas Ayoob, Ed.D., R.D., F.A.D.A. Harold W. Kohl, III, Ph.D.
Ellen L. O'Sullivan, M.S., Ph.D.
Russell R. Pate, M.S., Ph.D.
David A. Schultz, Ph.D., M.Div. Frankly, I wouldn't be surprised if there is also secret funding from Big Pharma,which stands to benefit most from the increase in diabetes and other chronic health conditions that will result from a high-sugar low-fat diet. Aside from boycotting the companies above -- which isn't hard to do if you already avoid added sugar and most highly processed foods -- we need to ask the federal government to stop lending its name to this disease causing website posing as a reputable source of nutrition information for children. Where are you when we need you Michelle Obama? Why Is Coconut Oil So Controversial? If you were brainwashed like I was that saturated fat is the devil, the idea of purposely consuming coconut oil is akin to drinking antifreeze. 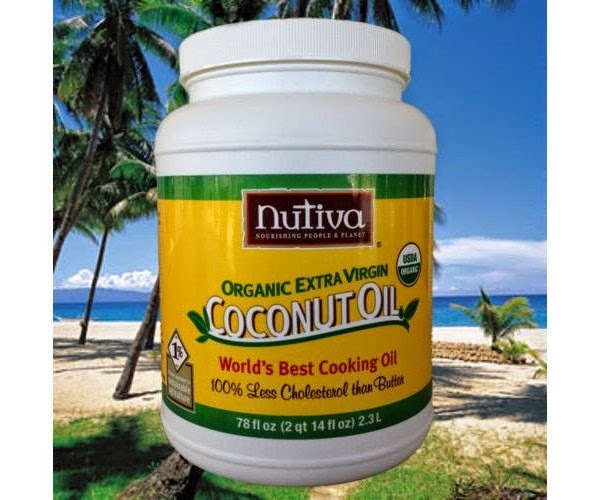 Coconut oil is 90% saturated fat. Although the federal government and most nutritionists still stand by their high carb, low fat diet recommendations (follow the money), many reputable peer reviewed studies now suggest saturated fat is not only healthy, but also an essential source of energy for people on low carbohydrate diets. Which is why the saturated fat content of coconut oil not only doesn't bother me, it's a benefit. What's more, coconut oil contains mostly medium chain fatty acids (MCFAs), which are metabolized differently than the short and long chain fatty acids found in most other fat sources. MCFAs head right to the liver, where they do not pass go or collect $200. They are quickly converted to energy instead of being stored as fat. Coconut oil is also thermogenic, which means it increase the amount of fat you burn. One study found that just 1-2 tablespoons of coconut oil a day increased the amount of energy expended in a control group by 120 calories. And like all fats, coconut oil will make you feel full and satisfied; so in addition to burning more calories, you will consume less calories per day since you won't feel hungry. The idea of food may still seems interesting, but you'll have no desire to eat it. You may also get sick less often if you consume coconut oil. Half of the fatty acids are lauric acid, which can protect against biological bad guys like bacteria, viruses, fungi and yeast. All this coconut oil propaganda may seem too good to be true, and I was skeptical, too. But the more I use coconut oil, the more I like it. And (knocking on head), I have yet to catch that pernicious flu going around this year. There are a million ways to consume coconut oil, but I most commonly cook with it instead of olive oil or add a spoonful to my smoothies. I've also used coconut oil to make a chocolate hard shell by adding cocoa and Swerve, melting them together in the microwave, and then pouring the mixture over some strawberries and walnuts. 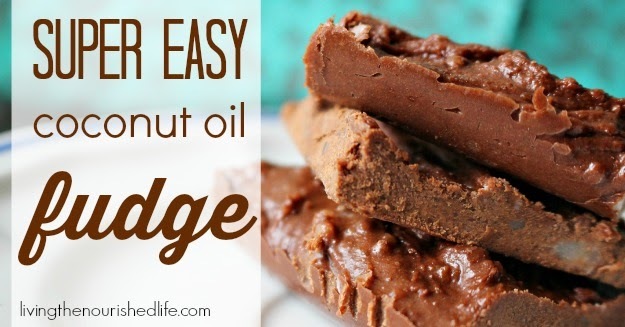 One recipe I really want to try is coconut oil fudge, only I would use Swerve or another erythritol sweetner like Lacanta instead of honey. You can always try a jar of coconut oil, and if you don't like the taste or nutritional benefits, use it as a hair conditioner or skin youth-enizer. It seems like you can do almost anything with coconut oil these days except drive it to work or send text messages. For many years, I was leery of eating diet foods that were sweetened with sugar alcohols, and not because I feared they would make me drunk. Unlike alcoholic beverages, no matter how many maltilol sweetened candy bars I ate, I remained stone cold sober. The problem with most sugar alcohols like maltilol, xylitol and sorbitol is that eating too much of them will cause gastric upset and frequent visits to the little girl's room. Can I get any more euphemistic? So when I discovered there was one sugar alcohol that does not cause stomach problems, I was over the moon, although it's name is as plain Jane as you can get: erythritol. Sounds more like something your doctor gives you for strep than a virtually zero calorie sweetener that travels through your body like a stealth missile and fools your mind into thinking you've consumed something sweet. Sure everyone raves about stevia, but that stuff tastes nasty. If I want my food to taste like bitter licorice, I'll add anice. Erythritol, on the other hand, has no weird off flavors aside from a mild cooling effect. So far, my favorite commercial sweetener containing erythritol is Swerve, which can be purchased in both granular and powdered forms at healthier food stores like Whole Foods and Sprouts and online at Amazon and other websites. According to the company's official website, "Swerve is zero-calorie, non-glycemic and safe for those living with diabetes. Human tests have shown Swerve does not affect blood glucose or insulin levels." In addition to erythritol, Swerve contains oligosaccharides -- non-digestible fiberish carbohydrates that supposedly help grow beneficial bacteria in the large intestine. You can cook with Swerve, bake with Swerve or add it to your smoothies and lemon water. 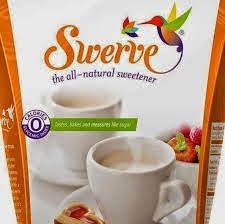 If there is a downside to Swerve, it's not cheap, but I use so little sweetener in my daily diet that I likely spend less money on Swerve than most families do on sugar. While researching Swerve and erythritol, I came across another promising product I just ordered on Amazon to see how the two compare. The sweetener is called Lakanto, and instead of oligosaccharides, it combines erythritol with monk fruit a.k.a. Luo Han Guo. I will update you on which product I like better after I receive it. Meanwhile, if you're interested in learning which commercial products contain erythritol, this forum on the Low Carb Friends website has some good suggestions. Be sure to check labels, though, since erythritol is expensive and some commercial products have reformulated with cheaper sweeteners.